This week, I thought it was time my son got his own special lunch. It has been awhile since I made one for him specifically, mainly because it's summer and we have been crazy busy. I wanted to try out these fun new cutters that I received from BentoUSA. They are a new release in their CuteZCute line. They were so easy and fun to use, a must for parents with a busy schedule! I also wanted to use more of my new lunch box containers from Fit & Fresh. This is their bento box model. To see my recent review of their products click HERE. Why did I make tiger sandwich? Well, first of all because we had the right food, and second I thought my son would like to take a bite of this ferocious beast. I used chicken, bread, cheese, and greens so that he could make his own sandwich if he wanted to. I also thought the mango fruit dish was a fun addition. 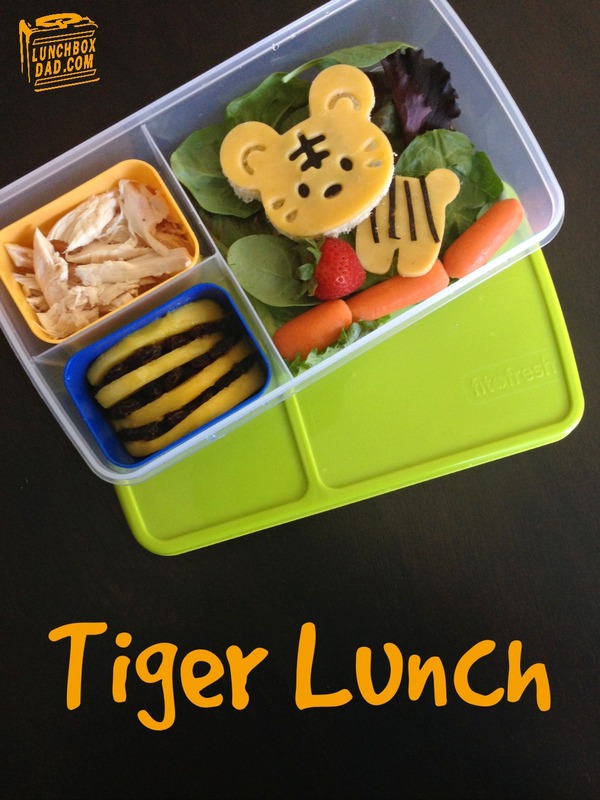 If your kids are a fan of animal themed lunches, you might want to give this easy one a try! 1. 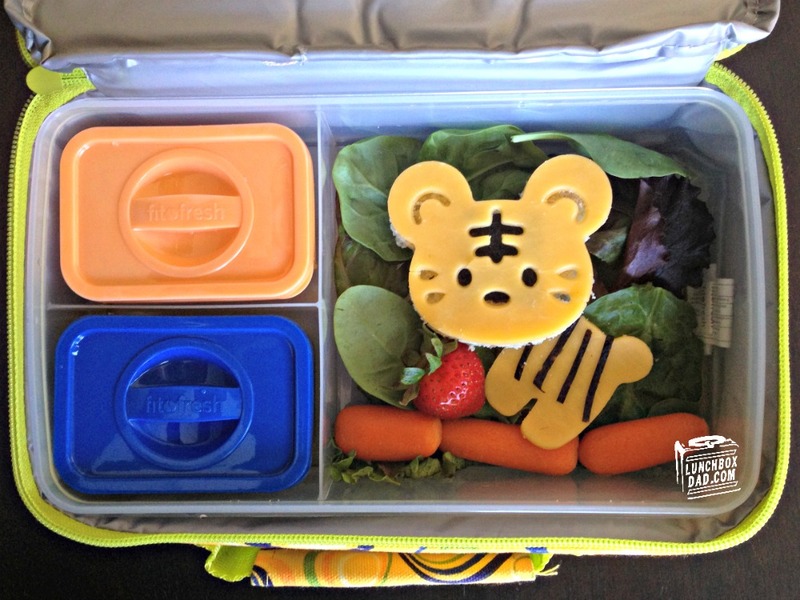 Use CuteZCute cutter on bread and cheese to make tiger shape. Seriously, the tiger is that simple. 2. Put nori square on bread and then cheese on bread. Place nori strips on cheese as shown. 3. Arrange mixed greens as the background in the main dish and place tiger, strawberry, and baby carrots around as shown in picture. 4. In first side dish, place desired amount of shredded chicken. 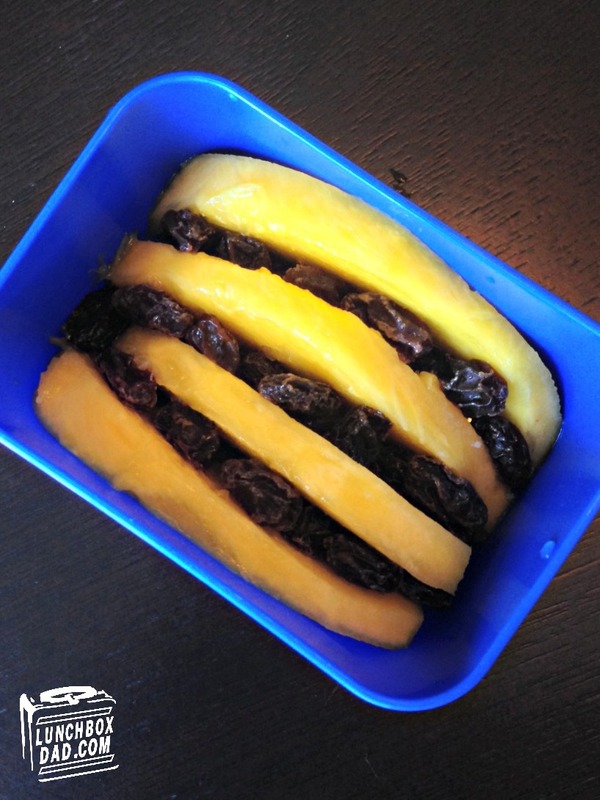 In second side dish put the mango slices side by side and then fill in the gaps with raisins. This makes your tiger striped fruit dish!